The Thornborough Henges are an unusual ancient monument complex that includes the three aligned henges that give the site its name. The complex is located near the village of Thornborough, close to the town of Masham in North Yorkshire, England. The complex includes many large ancient structures including a cursus, henges, burial grounds and settlements. They are thought to have been part of a Neolithic and Bronze Age 'ritual landscape' comparable to Salisbury Plain and date from between 3500 and 2500 BC. This monument complex has been called 'The Stonehenge of the North'. Historic England considers its landscape comparable in ceremonial importance to better known sites such as Stonehenge, Avebury, and Orkney. In recent decades, there has been public concern about the impact on the ritual landscape of quarrying by Tarmac. 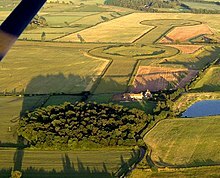 The cursus is the oldest and largest ancient monument at Thornborough. It is almost a mile in extent and runs from Thornborough Village, under the (later) central henge and terminates close to the River Ure in a broadly east/west alignment. Cursuses are perhaps the most enigmatic of ancient monuments. They typically comprise two parallel ditches, the larger of which can be a mile or more in extent, cut to create a "cigar shaped" enclosure. Typically, burial mounds and mortuary enclosures are found alongside cursus monuments indicating that they probably had a ceremonial function. The three henges are almost identical in size and composition, each having a diameter of approximately 240 metres and two large entrances situated directly opposite each other. The henges are located around 550 m apart on an approximate northwest-southeast alignment, although there is a curious 'dogleg' in the layout. Altogether, the monument extends for more than a mile. The 'dogleg' in the layout appears to cause the layout of the henges to mirror the three stars of Orion's Belt. The exact purpose of the henges is unclear though archaeological finds suggest that they served economic and social purposes as well as astronomical ones. All three of the Thornborough henges and the narrow strip of land connecting them are Scheduled Ancient Monuments. However, the land is privately owned and there is no official public access. Despite this, the site does have a steady stream of visitors throughout the year. 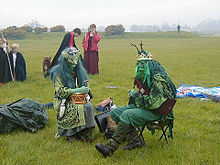 Since 2004 there has been an opportunity for public access to the central henge, which is owned by Tarmac Northern Ltd. to attend the celebration of the ancient Gaelic festival of Bealtaine. On 1 May 2005 this event was attended by around 150 people from across the north of England. Extensive quarrying has destroyed much of the monument's setting to the north and west of the henges. The site lies within the wider Nosterfield quarry area being exploited for gravel by Tarmac Northern Ltd. Although the henges themselves are not threatened, Tarmac now wishes to extend its quarrying operations to a 45 hectare site less than a mile east of the henges known as 'Ladybridge Farm'. Preliminary investigations of this area of land to discern its archaeological significance have suggested that it may have been a location of ritual Neolithic encampments, possibly used by those people who built or visited the henges. Opponents of the plan claim that if permission was granted for this area to be quarried, much of the remaining contextual information about the henges would be lost. A campaign led by local people and concerned archaeologists is attempting to persuade Tarmac and North Yorkshire County Council to guarantee the protection of the area. British planning and archaeology guidelines prefer preservation in situ of archaeological remains. In cases where this is not possible, such as quarrying, preservation by record is an option, involving archaeological excavation. Campaigners argue that further excavation and subsequent quarrying will destroy the ritual landscape completely. In February 2006 North Yorkshire County Council turned down Tarmac's application to expand quarrying to the Ladybridge Farm site. Later in 2006 Tarmac submitted a revised planning application to North Yorkshire County Council. The revised application for Ladybridge, which is adjacent to the Nosterfield Quarry, reduced the proposed area for sand and gravel extraction from 45 hectares to 31 hectares, avoiding the south west section of the site to address concerns raised about archaeology. The application was approved in February 2007. Late in 2007 campaign group Friends of Thornborough requested a judicial review of the planning permission due to a number of procedural irregularities. In response, North Yorkshire County Council ruled the permission to be "fatally flawed," and withdrew the permission previously granted. It is now planned that the planning application will be re-determined by North Yorkshire County Council planning committee on 22 April 2008. Planners indicated that granting of permission was likely. However, campaign group TimeWatch raised the issue of Neolithic archaeology found within the new quarry area since the last planning meeting. In November 2016, North Yorkshire County Council’s planning committee agreed with the owners Tarmac to approve further quarrying in return for preserving[clarification needed] the site of the Thornborough Henges and 90 acres of surrounding land, which would eventually be handed over to the public body. ^ Historic England. "Thornborough Henges (52056)". PastScape. Retrieved 11 January 2019. ^ Hammond, Norman (24 August 2004). "Battle to preserve Thornborough henges". The Times. Retrieved 11 January 2019. Wikimedia Commons has media related to Thornborough Henges. Thornborough Henges and the Ure-Swale Monuments, Assessing Evidence of Geospatial Intelligence in the Neolithic.